FJORDMAN INTERVIEW IN GERMAN PAPER JUNGE FREIHEIT: EUROPE IS THE SICK MAN OF THE WORLD…….. – The Tundra Tabloids……. 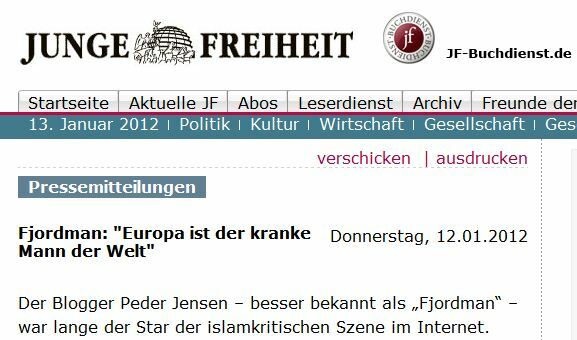 FJORDMAN INTERVIEW IN GERMAN PAPER JUNGE FREIHEIT: EUROPE IS THE SICK MAN OF THE WORLD…….. NOTE: The Tundra Tabloids thanks Fjordman for sending this first to the TT. I was asked whether it was OK to publish a few of my essays in German, and I said yes. I am currently completing a different kind of book in English called The Curious Civilization, which should be available at some point in 2012. Germany is a very important country for the future of Europe as a whole so it is of great significance to be published there. The title Defending Europe is appropriate in my view because European civilization is going through a low point in its history right now. Today, merely saying positive about the European cultural heritage and the peoples who created it is almost considered a sign of extremism. Bat Ye’or is one of my spiritual mentors. She has described with frightening precision the organizational and mental mechanisms behind the ongoing Islamization of the Western world. I have never once met Anders Behring Breivik in my entire life and have been checked out of the case by the police after an extremely thorough investigation that at best operated at the very fringes of what could be considered legal. I am obviously aware of the fact that I am one of the many people who have been quoted a number of times in ABB’s so-called manifesto. I intensely dislike this, as most sensible people would do in my place, but since all of my writings are available on the Internet there is, sadly, little I can do about that. I see no reason why others should be held accountable for the acts of an insane person they have never met. I did seriously consider quitting as a writer in the immediate aftermath of the terror attacks due to the immense international pressure on my person at that time and because I genuinely felt horrible about being quoted by such a man. Being dragged into the Breivik case against my will is the worst thing that ever happened to me in my life. After coming to my senses and recharging my mental batteries I decided to continue after all. I remain dedicated to the truth. Whatever was true before Breivik is also true after Breivik. If I ever quit as a writer I want this to be my own choice, not something I am forced to do by others. I have studied Arabic language at the American University in Cairo and lived in Egypt during the terror attacks of September 11th 2001. I am not sure I would describe this as a turning point since I was already growing skeptical of Islamic culture and mentality before that time, but things certainly escalated after this event. What shocked me the most, though, was not witnessing how happy many Arabs and Muslims were over the mass murder of thousands of unarmed civilians. What shocked me the most was how Western mass media and the political establishment lied about this fact. 9/11 was in my view clearly an Islamic Jihadist act of war against Western civilization, yet the West was in complete denial about this. I also worked in Israel and the Palestinian territories as an observer in Hebron in 2002 and 2003 and could there see first-hand how biased, anti-Israeli and pro-Islamic much of the media coverage from this region truly is. I myself narrowly missed a suicide bombing in Tel Aviv on April 30, 2003 that was committed by a young Muslim man who was a British citizen. I could literally hear the explosion behind me as I had just left the nice beachfront area where this happened a few minutes earlier. Two of my colleagues were murdered in March 2002 in a Jihadist terror attack by the very Palestinians we were supposed to help. In contrast, I found most Israeli Jews to be friendly, with the partial exception of a few of the most militant settlers. I haven’t talked a lot about war, I am merely pointing out that Islam declared war against Europe and the rest of mankind 1400 years ago. This is not “extremism.” Mainstream Islam stipulates that Jihad should continue until every single corner of our planet has been firmly placed under Islamic rule. Portraying Europeans as aggressors after having been at the receiving end of an unprovoked Islamic campaign of aggression and conquest for over a thousand years is patently absurd. That being said, I am very much against some of the policies currently pursued by Western government and political elites. I am personally in favor of a strategy the American writer Lawrence Auster has dubbed separationism: We should physically separate ourselves from Islam and everything Islamic as much as is practically possible in an age of global communications, and limit ourselves primarily to brief interventions only when these countries pose a direct military threat to us. Undermining secular leaders like Mubarak in Egypt and aiding radical Islamic forces, as Western leaders have been busy doing following the so-called Arab Spring in 2011 that looks more and more like a Sharia Winter, is stupid and dangerous and could backfire badly. While Muslims and other outsiders are now infiltrating Western societies, it is unlikely whether they would have been able to do so without exploiting the internal decay and decline of the West itself. I sometimes fear that we are stuck in a form of ideological civil war within the Western world between Westerners and post-Westerners, between those who still hold emotional and practical loyalty to traditional European cultures and nations and those who want to dismantle European nations through promoting open borders and mass immigration. Islam is, strictly speaking, a secondary player in this game, but a very dangerous one nonetheless. The champions of cultural Marxism or Marxism in its many forms have contributed to Western decline, but there are other forces at work here as well. Europe is today the sick man of the world, but Islam is not a cure for that disease. Islam does not solve any problems; it only makes already existing problems worse and adds additional ones. Arabs remain conscious of and deeply attached to their history and heritage, as do the Chinese, Japanese and many other peoples. Europeans must learn to do the same once more. I think most of the answers to our current challenges can be found within our own, very rich cultural heritage, but if we have to borrow from other societies it is better to do so from successful ones such as the East Asian countries, not from failed Muslim countries. One of the very few things we can learn from Arabs is not to hand out citizenship like candy to people who happen to set foot on our soil. Arabs from oil-rich Gulf countries such as Qatar, Kuwait or the United Arab Emirates rarely grant citizenship to foreigners, even if they have lived and worked there for many years. They certainly don’t make the natives pay immigrants huge sums of money in welfare support so that they can import their relatives from abroad in “family reunification” and make them citizens as well. Guest workers in Dubai work and then they go home, unlike the Turks who are currently colonizing Germany. If Arabs can take proper steps to ensure their national survival and expel large numbers of illegal aliens without being branded as “racists,” why can’t Europeans do the same? Previous Post Previous Post IRANIAN BLOGGER WHO CRITICIZED THE TEHRAN REGIME CONVICTED OF INSULTING ISLAM……..
Next Post Next Post LIQUOR STORE BOMBED IN LEBANON……..
For someone that is supposed to be a right wing extremist, this man sounds awfully liberal to me, in the classic sense where universal human rights are a guiding principle. From my time in Norway especially, studying international law and human rights, I can understand the frustration and agree that Europe is not well and remedies prescribed by post-Westerners exacerbate the problems. God disappeared from Europe while in Israel God always put the cure before the disease. Much of what Fjordman writes resonates with common sense opinion, however this common sense has been labeled populism, racism, fascism, xenophobia and other pejoratives by the acolytes of the architects of Western cultural deconstructionism. The fact that political correctness dictates that Fjordman must be spun as an “extremist” and never debated on the facts and underlying ideas themselves is his biggest strength. Still, I find flaws in the thinking which he presents here. The first issue I take with Fjordman is what I can hardly see as anything but naïveté in his apprehension of the terrorist events of 9/11/01. I won’t argue this further though as I’m sure everyone has a clear opinion themselves on this subject. The more grave shortcoming of Fjordman’s perspective on global politics and underlying causes is in my view an absent comprehension of the “bigger picture”. To him Islam invading the Western world is the root problem, and the coadjutors among mainstream Western political groups are simply naïve. Fjordman just doesn’t behold in his vision the global chess board and its players setting up the various opposing groups and directing events straddling not only decades, but centuries. Again, I’m not going to discuss here what I am alluding to. Those who are well-read and possess situational awareness know what forces and dynamics these are. “A little knowledge is a dangerous thing,” and unfortunately Fjordman’s understanding of the territory, both ideologically and ontologically, of which he makes a figure for himself mapping to those still less informed, is covered by this aphorism. And thus he himself becomes a piece on the chess board, perhaps not a pawn, but a piece to be played nevertheless. So what you’re “alluding to here is….. the Jooooos. right? Is that what you’re saying here Halvor? Why don’t you just come right out and say it? Embrace your anti-Semitism for all of us to see and to loathe. Again, I’m not going to discuss here what I am alluding to. Why not, actually? Would doing so be criminal? I’m inclined to assume so, and invite your comment. The first issue I take with Fjordman is what I can hardly see as anything but naïveté in his apprehension of the terrorist events of 9/11/01. I won’t argue this further though as I’m sure everyone has a clear opinion themselves on this subject. Elaboration is sorely needed. What’s ‘naïve’ about the Islamist assault on one of the main cities of the free world? 19 terrorist and 4 airplanes was all it took, and the result was the greatest wake up call since Pearl Harbour. an absent comprehension of the “bigger picture”. Will you be so kind as to elaborate on this obscure statement? Does it refer to the machinations of Central Banking, military-industrial complex, or similar? Having the details on the table facilitates fruitful discussion and debunking of ancient misunderstandings. If you want to contribute, I encourage including much more detail. Yes, europe is a sick old man, contagioned by the evil feminists and now he’s suffering on post traumatic female-phobia. He’s alluding to the master plan being orchestrated to exterminate both the Jews, and the Moslims in the coming world war 3, one against the other. For this to be effective, all other nationalities must hate these two groups, to ensure there is no effective opposition. If Jews and Moslims had any intelligence, they would realize that God isn’t offering them all these favours, at the expense of European culture, for nothing. They are being enticed to become greedy scum, so God can exterminate them all. “God” referres to the higher echelons of power, which don’t exist in our day to day lives. They have actually planned this centuries ago, and all this “talk”, are the pawns trying to figure out why they need to sacrifice their lives, in the great chess game that God is playing.